I had just arrived in London and unfortunately, I had left my bag containing my camera in a black cab (which I'm still absolutely gutted about). As a result, I am now left to resort to my iphone for blogging until I purchase a new camera. I'm sorry if my pictures are not up to par, but I had to make the most of what I have on hand. My parents have never been to England and I thought it was necessary to make a reservation at the Ritz for afternoon tea (we booked months in advance). It's funny that I didn't make more of an effort to try afternoon tea when I was living in London, but it's better late than never. And this time around, I'm able to share this experience with my parents. Upon entering, the hotel was pretty magnificent. A long hallway leads you to the main seating area known as the Palm Court with a gorgeous skylight to bring in the natural light. The restaurant has a strict dress code, where gentlemen are required to wear a jacket and tie. The table setting was elegant placed with fine china and silverware. There are three types of afternoon teas to choose from: The traditional afternoon tea at 52, the champagne afternoon tea at 68 and the celebration afternoon tea at 63. We chose the traditional afternoon tea, which was still plenty of food and tea to go around. ASSORTMENT OF AFTERNOON TEA PASTRIES/CAKES: These cakes were freakin amazing! There was so much food that I actually could only try a bit of each. The chocolate bomb with the cherry on top was absolutely delicious. SANDWICHES: Scottish smoked salmon with lemon butter on sourdough bread was my favorite. The salmon was soft, fresh with a delightful smoky aftertaste. The bread was super soft. It is what I imagined a tea sandwich should taste like. They even gave us seconds! FRESHLY BAKED RAISIN AND PLAIN SCONES: The scones were absolutely delicious. They were piping hot when they were brought to our table. I much preferred the plain scones since I'm not the biggest fan of raisins. They were flaky and buttery. It wasn't overly dense which I appreciated. CORNISH CLOTTED CREAM AND STRAWBERRY PRESERVE: The clotted cream is one of my favorite things in England and this was the highlight of my day. It's like butter but 100x better! It's rich and thick and spreads on well with a creaminess that can't be beat. The strawberry preserve was so delicious as well! Overall, I had an absolutely lovely time at the Ritz. 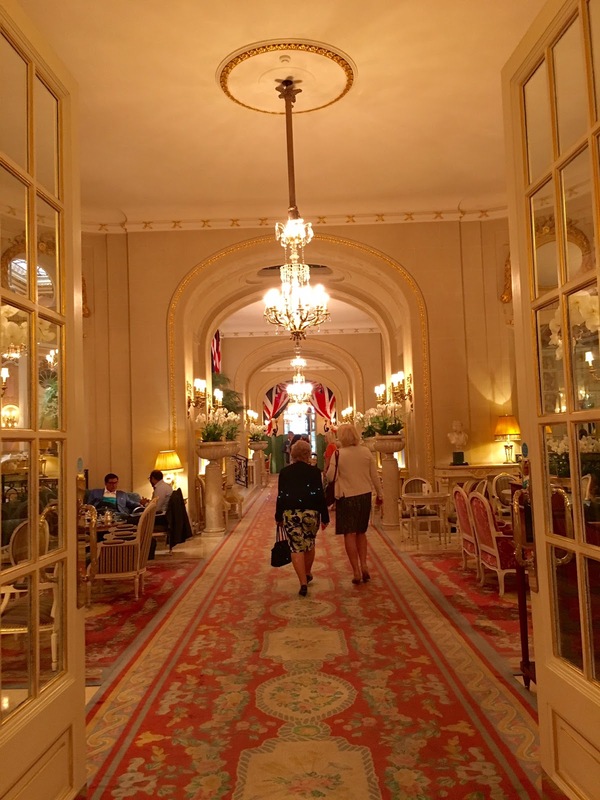 It is one of those iconic landmarks to have afternoon tea. I am so happy I decided to have it here and share the experience with my parents. The service was impeccable and the food was actually quite filling. The tea was delicious. You couldn't go wrong with any of the options from the menu. It's important to book in advance online as reservations can fill up. Below, you can check out a video of how it's like at the Palm Court.